Coffee with Bassnectar + Boreta, Be Interactive Board Members! Watch performances from Bassnectar, The Glitch Mob, Dead Prez, Ninth Child, Zion i, Ashel SeaSunz, and Xiutezcatl Martinez! Be Interactive, a 501(c)3 nonprofit organization, is inspiring the empathetic to do more good in the world. Music has been our catalyst for a decade. The Bassnectar Experiment has already raised hundreds of thousands of dollars for charities, and invested uncountable hours in good deeds. Be Interactive takes the old school approach of the nonprofit world and combines it with the new school technique of personal impact — what can you do with your own hands? Your friends? Your community? There will be a new theme for community improvement four times a year, as well as a grant application. We're giving the money raised at our shows back to the community by funding these projects directly. One lucky winner and a friend will be winning tickets to Bassnectar's Be Interactive Launch Pary in San Francisco. If you win you'll get to watch performances from Bassnectar, The Glitch Mob, Dead Prez, Ninth Child, Zion i, Ashel SeaSunz, and Xiutezcatl Martinez! Plus you'll get to ingest some afternoon caffeine with Bassnectar and Justin Boreta of The Glitch Mob on the day of the Be Interactive Fundraiser in San Francisco! After meeting up and chatting about life, the nonprofit, or whatever, you'll return to Historic Bill Graham Civic Auditorium that night with two tickets to the sold out show. It's going to be an amazing experience and you'll be part of launching Bassnectar's new project in style. Please note: no travel is included for the fundraiser, you will have to get yourself to the show! 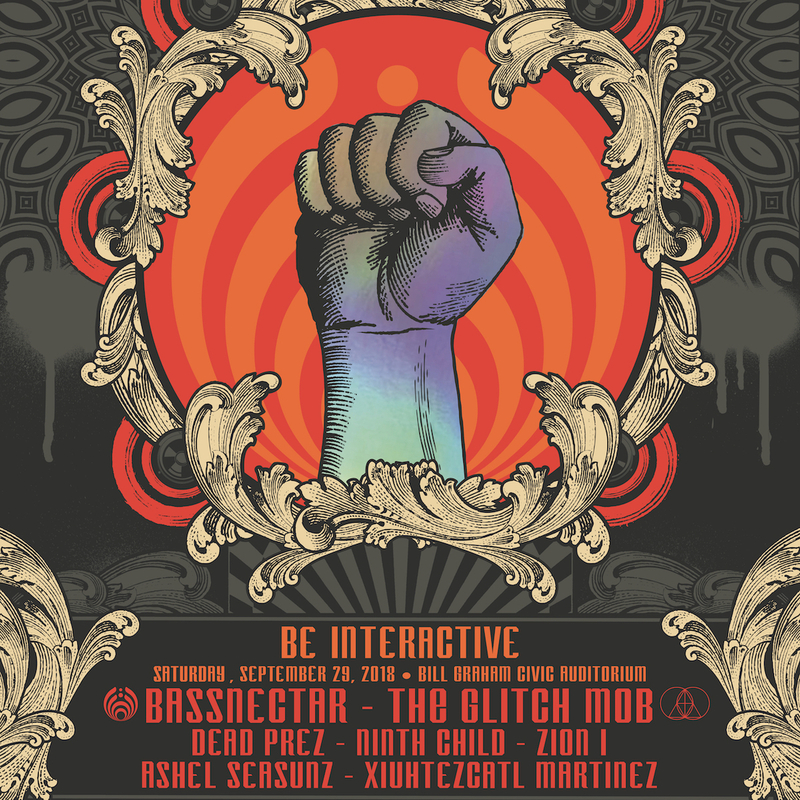 Just take one action in support of Bassnectar's Be Interactive project to be entered to win. Then keep taking action to earn more points and increase your chances!